Looking to lay some concrete in Lubbock? Want to redo a sidewalk, build a patio or re-pour a Lubbock driveway? We can do that and more! Building a new business and need concrete poured? Need a parking lot made? We do concrete and asphalt! At Lubbock Concrete we are not just Concrete. We handle all your home and commercial needs. Have you been dreaming of that perfect outdoor grill/kitchen? Need a new fence from the last West Texas wind? Building a new office in Lubbock? Need Asphalt, concrete poured, Bathrooms and more? We can handle all Commercial jobs, Large and Small. Call the professionals today at 806-329-0440 or fill out the form on the right for a free quote. 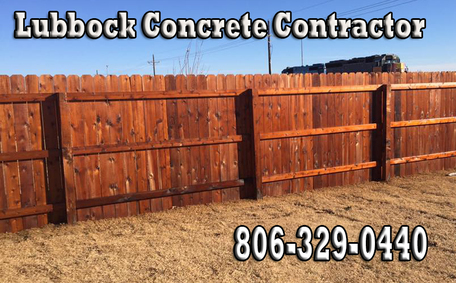 We are the pros for not only all your Lubbock Concrete projects but also experts in Fence building, Fence staining, Cabinetry, Painting, Outdoor Kitchens and Living spaces, Decks, Pergolas, Windows and doors and General construction needs. At Lubbock Concrete Contractor, we can make your remodel dreams a possibility. ​Whether its a small fence staining project, or a large new outdoor space, we can make your project a success with ease, and with a price that is guaranteed to make you smile. We are the Contractor professionals with easy contact, competitive pricing and amazing finished products. Let us take care of all your needs, large or small, in Concrete, Fence, Outdoor spaces and more! We want to be your favorite contractor for all your needs in the Lubbock, Midland, and Odessa areas. Give us a call today for all of your local contractor needs. You will be glad you did. We handle all of your commercial and residential needs. Big or small we have and can handle them all. Let us be your local contractor. Call us today! We are serving the Lubbock, Shallowater, Wolfforth, Idalou, Slaton, Post, Crosbyton, Midland, Odessa and all other local areas. 1. We are locally owned and operated. We love Lubbock! You aren't getting "Made in New York City" work here- we are local, speak with a Texas 'twang and are True Texans at heart. 2. We are competitive. We want to have you as our customer and so we will give you a great price with high quality work. 3. We use the best! We have top notch Concrete, Fencing, Outdoor spaces, Paint, and more. We want you to have the best for your home or office. 4. We can do it all! From Concrete to fence, Painting to windows and doors, we can cover ANY of your Contracting needs. Just give us a call or complete the contact for so we can complete ALL of your needs. 5. We will travel! We are taking jobs for the Lubbock, Midland, Odessa and in between areas. We want to work for you! Call us today! We offer many services at Lubbock Concrete Contractor. Serving the Midland, Odessa and Lubbock areas. Call us today for all your construction needs. We look forward to serving you. "We recently used Lubbock Concrete Contractors for our recent landscaping remodel in our backyard. We are so glad we chose them, not only did they have the best prices but the best products as well. We have told all of our friends about them." "Our fence needed a major overhaul. It was falling to pieces. We called Lubbock Concrete Contractors they came right over and started the next week. We are now so blessed by our Privacy Fence, and gladly recommend them to all our friends and family." "We called Lubbock Concrete Contractor this past summer when we decided to build our own outdoor kitchen. They did a great job. Now our outdoor kitchen is the envy of all of our friends."